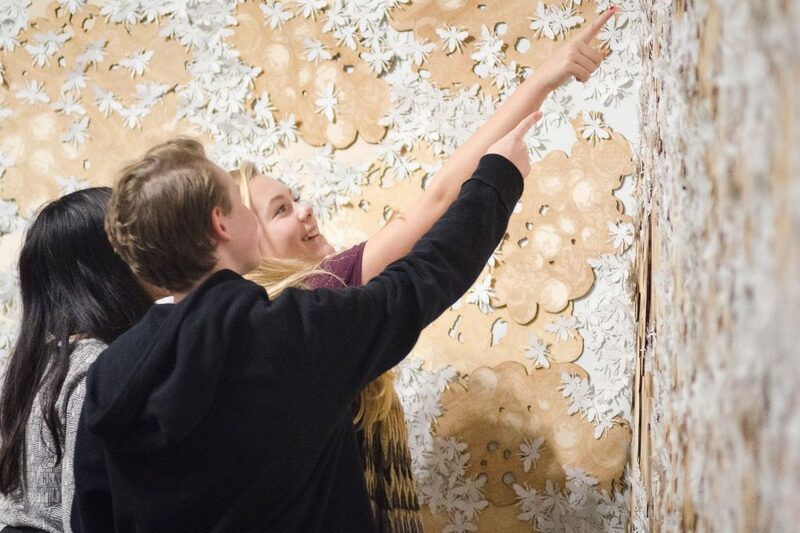 Viewing and discussing contemporary art is an excellent way to engage students with current issues while developing visual literacy and critical thinking skills. Our free, guided gallery tours involve students in group discussions and reflection through drawing and writing activities. Please book your visit at least two weeks in advance by using our online form or by contacting our School Art Program Coordinator, Melanie Devoy. A confirmation email will be sent once the booking is finalized. Can students sketch in the gallery? Yes! We encourage students to sketch the exhibition artwork. Please bring your own sketchbooks and drawing materials (graphite pencils only). Clipboards can be provided if requested in advance. We can work with you to accommodate your schedule. The guided portion of the tour is approximately 25 minutes with the rest of the visit for independent viewing, sketching, and/or writing activities. Once our visit is booked is there any preparation I can do with my class? Absolutely! Prior to your visit, you will receive a teacher guide with information about the exhibition and the artists, with some discussion questions and pre-visit classroom activities. What if I want to do a self-guided tour? We request that all groups wishing to visit the gallery contact and book a time with us to ensure that the gallery space is available. Please contact the School Art Program Coordinator to schedule your visit at least two weeks in advance. Is there somewhere for students to eat? Food and drink are not permitted inside the gallery, so please eat snacks or meals before arriving. There are no lunchroom facilities available at the Cultural Centre, however weather permitting, groups are welcome to eat at the picnic tables outside in the plaza. Photography is allowed during the art workshop in the gallery classroom, and is sometimes permitted inside the gallery during certain exhibitions. Please check with the School Art Program Coordinator prior to your visit. There is free parking available at the Cultural Centre and Arenas parking lot and parkade. Please check signage as some parking is limited to 3 hours. Free all day parking is available on the upper level of the parkade. Where is the gallery located, and is it accessible by transit or school bus? The Richmond Art Gallery is located inside the Richmond Cultural Centre. The gallery can be reached by Canada Line, and is a 10-15 minute walk from Brighouse station. See our location map and directions. There is a school bus drop off lane on Minoru Boulevard next to the eastern entrance, and the parkade can be accessed from either the Minoru Boulevard entrance or from Granville Ave.